I’ve been very interested in attending one of the Rollerblade 10K Challenge events that have been popping up around the world. I finally had my chance when Myles Cotter-Sparrow asked me if I wanted to ride with him down to Boston for a Rollerblade 10K Challenge hosted by Gabe Holm of Thuro Shop. The challenge was to take place at 7:30pm on a Tuesday night at the start of Boston’s weekly night skate. On Tuesday morning I drove a little over an hour from my home in Lyndonville, Vermont to the Rollerblade Headquarters in West Lebanon, New Hampshire. There I met up with Myles and jumped into the Rollerblade van for the 2.5 hour drive to Boston. 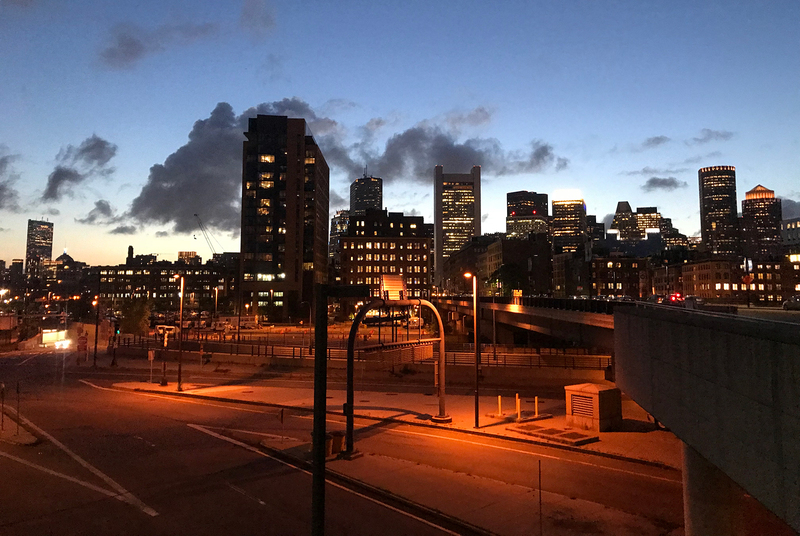 We arrived in Boston around 3 pm and as we are entering the city on a very high overpass, I looked to the right and saw no other then Remo DiTullio airing the hip at Lynch Skate Park. Gabe Holm in front of his Thuro Skate Shop in Brookline, Massachusetts. Photo by Myles Cotter-Sparrow. We made our way to Thuro Shop to meet up with owner Gabe Holm and hang out at the shop for a bit. We still had a lot of time before the 10K was suppose to begin so Gabe suggested Myles set up the Rollerblade van on a nearby trail. Myles made himself his own parking spot off the trail and pulled out the demo skates to get people rolling. I decided to check out the trail and ended up skating a little under six miles up to and around Jamaica Pond and back. The trail was an absolute blast to skate on. The pavement was new and perfect and I even found an awesome downhill to bomb during traffic. After my decent, I made my way back to the van to check on Myles. Unfortunately the trail we picked to park on was more of a commuter trail instead of a recreational trail, so everyone on it was just trying to get home from work and didn’t wanted to stop to demo skates. We headed back to the shop and by then I was famished and needed some food. Gabe recommended I check out Toichi Ichiban. I knew we were about to skate, so I wanted to keep it light. I ordered a Poke Bowl and a Spider Roll and all of a sudden the cooks brought me various food to sample. Then they gave me some kind of smoothy, that was really delicious. My goal of eating light was a failure and now I was completely bloated and about to go skating. I looked at my watch and it was already 7pm. I ran back over to the shop fearing everyone would be waiting on me because I was running late, but luckily Gabe was still with a customer. At about 7:10 we jumped into van to head over to the meet up spot. We had to lace up in the van because we were running late and didn’t want to make the locals wait on us. We found a spot near Boston Commons and skated over to the Esplanade Playspace to meet up with everyone. There was a solid group of about 20 people that showed up to skate the 10K Challenge. We took off and skated along the Charles River in the direction of Cambridge. The trail was flat and smooth and super easy to skate. It winds through parks along the river for miles and has stunning views of Boston. At the 5km mark we turned around and headed back to the Esplanade Playspace. The return skate was actually a lot more fun because the sun wasn’t in my eyes the whole time. Eric Anderson skated like an animal and beat everyone to the finish line. I have never skated in Boston before and since living in Vermont I’ve been really wanting to go down there to skate. I had attempted to do it three times before but was hindered by snow and rain. Urban skating has definitely become my favorite form of skating. There is nothing like the freedom of cruising down city streets, especially in a group. There is no better way to see city like when you see it on your blades and take in the surroundings. 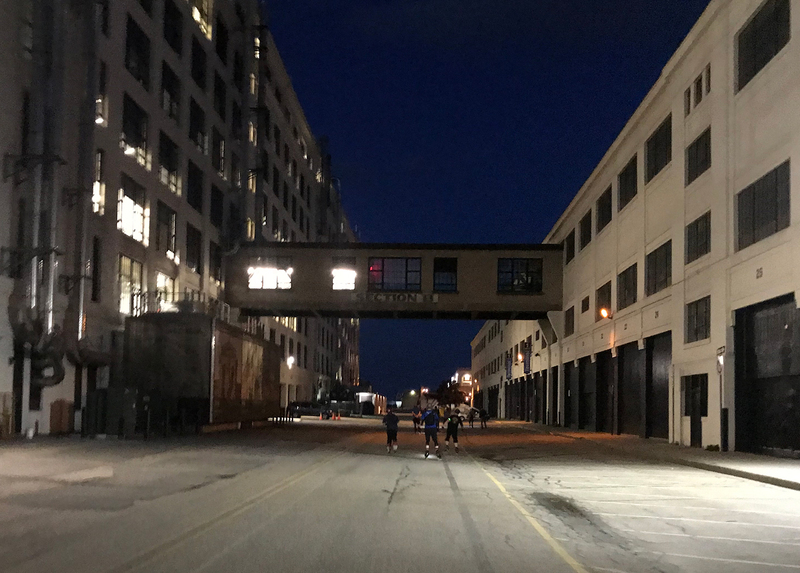 We skated a little over six miles around the city, during which we passed through some massive ship terminals across from Logan Airport. The views of the container ships being loaded and the line of illuminated planes flying into the airport was stunning. 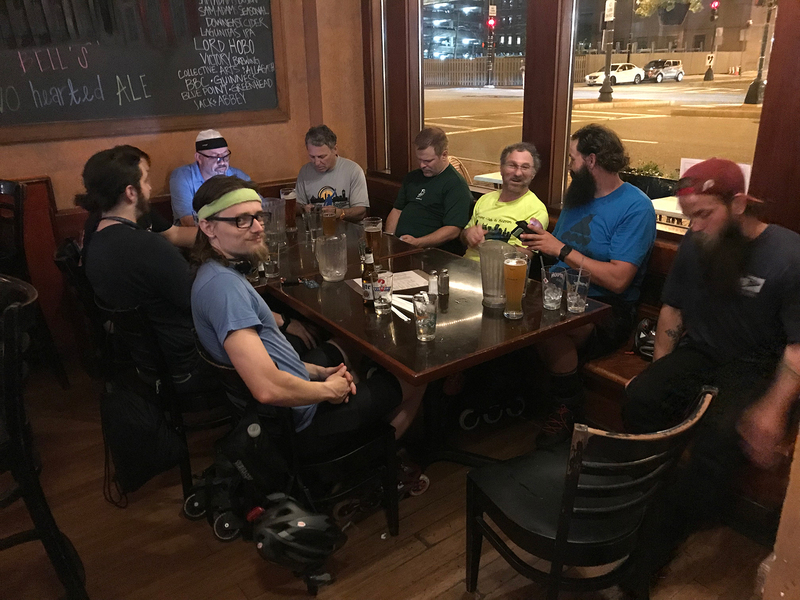 Every week the Tuesday Night Skate ends at The Hill Tavern, which has a large selection of New England craft beers and some excellent food. We spent a good two hours socializing before heading back to the Rollerblade van. 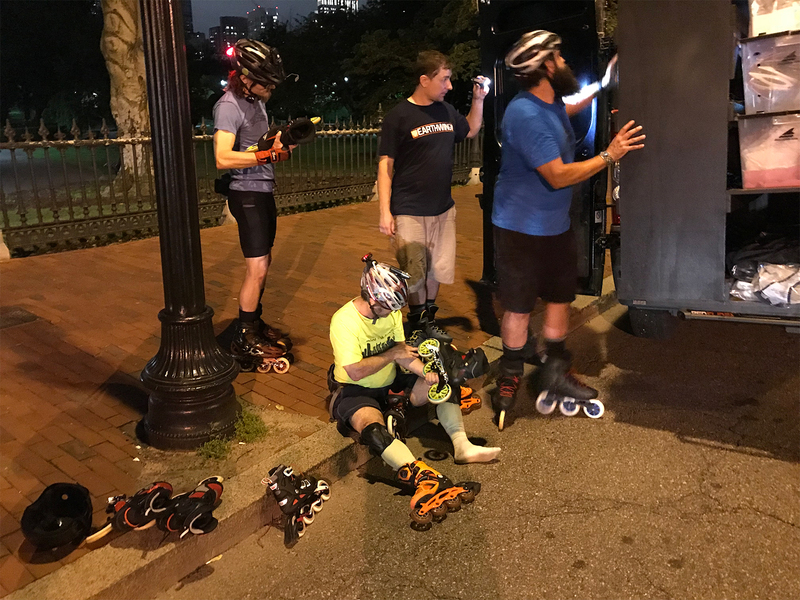 It was nearing midnight and several of the skaters still wanted to demo some Rollerblade skates! 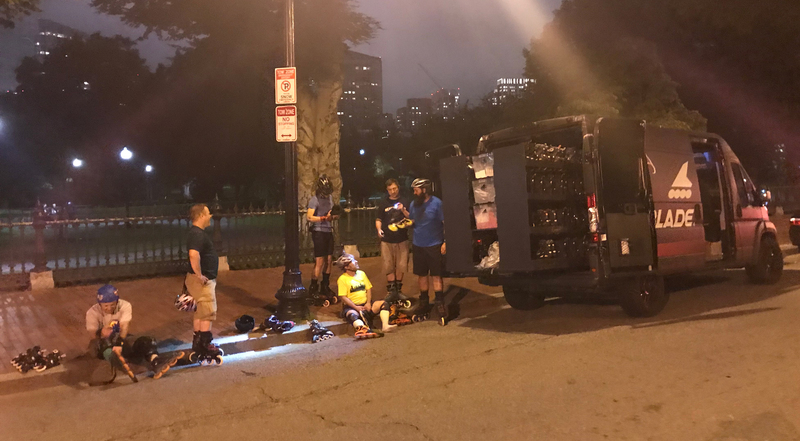 Everyone put on fresh Rollerblade setups and cruised the streets around Boston Commons for a bit. Apparently you are not “suppose” to skate in the Commons itself, but when has that ever stopped a blader. It was funny because there were lots of cops there and they just all waved at us. The main trail in the Commons is very wide and goes down a long straight hill. We skated to the top of it and bombed back down, right past the waving cops, all the way to bottom which was completely wet from sprinklers. We ended up doing cess slides across the water for a good 10-15 minutes before heading back to the van to meet up with those who didn’t want to follow us into the Commons. One Last Skate Before Heading Back Home. Myles Cotter-Sparrow, Gabe Holm and myself bombing hills the next morning. Photo by Myles Cotter-Sparrow. I had a really great time in Boston and it is a super fun city to skate in. If you live there or are just visiting I recommend you go on the Tuesday Night Skate. 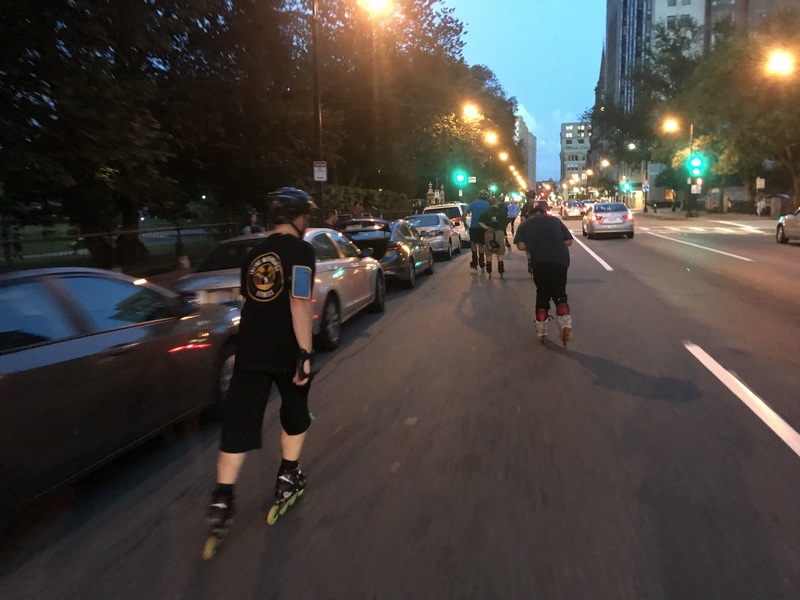 There are several other skates sessions happening in Boston every week too, so make sure to check out the Skate Boston Facebook Group for all the information you need for an excellent blading experience in the city. I plan on being there several more times this year before winter arrives in New England. To find out more about the Rollerblade 10K Challenge visit the official page here. For more information on Rollerblade visit rollerblade.com. 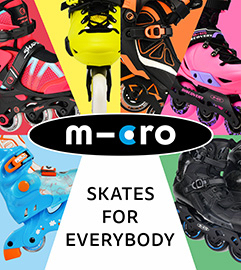 Visit thuroshop.com for all your skating related needs. And if you are in New England, stop by Brookline, Mass and check out their retail store! Join the Skate Boston Facebook Group to find out about all social skates, trails and gatherings happening in the Boston Area. 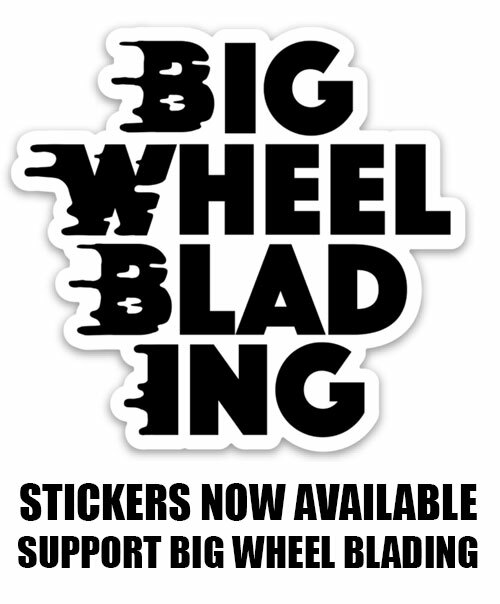 You can also visit the Inline Club of Boston website for lots of resources for skating in Boston. It was a lot of fun and I look forward to heading back to Boston in the near future. I hope you have fun at Big Apple Roll!! !